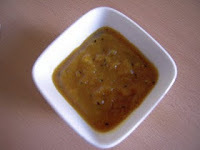 Nayna's Murrbo, a tasty and flavorful sweet mango chutney goes great with papadams, tortilla chips, parathas and puri. She says that this chutney can be refridgerated for future use. She recommends the use of sterilised jars for storing the chutney.The picture of murrbogarnished with cloves and cinnamon is feast for our eyes. 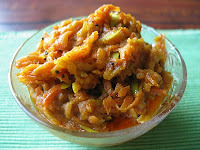 Jyoti gives us a recipe for flavorful "Green Mango Chutney". Cumin powder and fennel enhances the flavor of this chutney. She says that this is best dip for chips and papad. She shares us a beautiful picture of her preparation. Muskaan comes up with her novel "Chunky Pineapple Salsa" recipe for your favourite chips. This delicious salsa is so perfectly captured in the picture. PJ is talented enough to change a fruit that got least attention at her home to a delicious chutney. 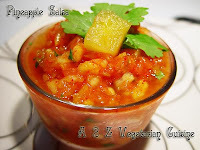 She says that this sweet, sour and spicy "Pineapple Chutney" is worth trying. 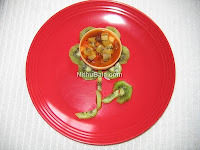 She shares us a beautiful picture of her creative dish. Jagruti's "Guava Chutney" looks too good. She feels nostalgic as she has lot of wonderful childhood memories related with this chutney. 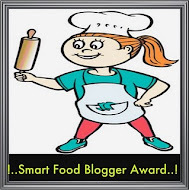 Her picture is the standing proof for her delicious chutney. 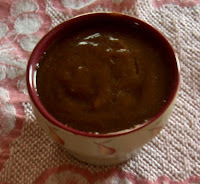 Subhashini's "Dates & Tomato" chutney is Orissa's speciality chutney. Her chutney tastes too good with the addition of panch phoran. Take a look at her nice picture, no doubt you would immediately fall in love with her chutney. 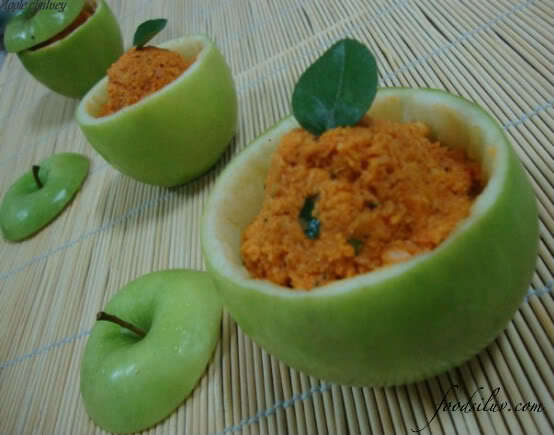 An innovative dish "Apple Chutney" made of green apples from Padma is a good to go dish for tangy taste lovers. Take a look at her wonderful picture. 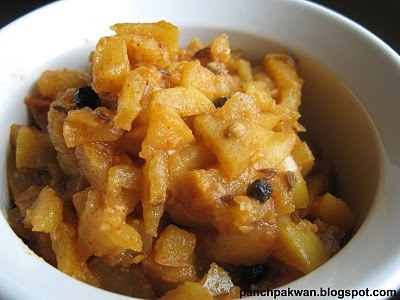 Meena's "Apple - Pear Chutney" tastes sweet and tangy. Her kids enjoyed eating the chutney with roti and dosa. Her chutney picture with green BG is very lovely. 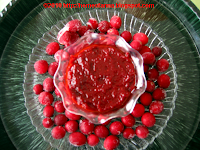 Silpa's "Cranberry Chutney" is very attractive with bright red color. This chutney tastes too good with sandwich, biscuit and chapathi. You can't resist yourself from trying out when you get to see her picture. Ruchika's "Chakka Varati" tastes sweet and is very aromatic with the addition of cardamom. She shares a nice picture of Chakka Varatti. Gita's unique "Apricot Pachadi" goes good with rice and roti. 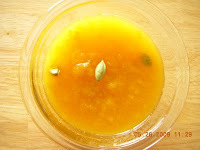 She is innovative enough to change a sour apricot to sweet pachadi.The picture of Apricot pachadi is so colorful. Gita's "Cranberry and Onion Chutney" is very similar to tomato and onion chutney. Just to balance the extra sourness from cranberry, she adds jaggery to this chutney. 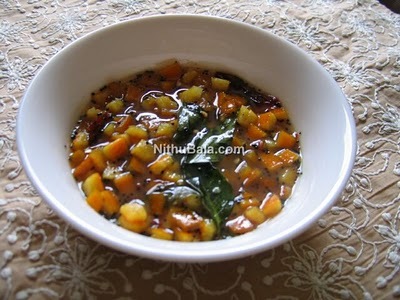 She says, this chutney tastes good with Idly and Dosa. The cranberry chutney picture is very attractive. star anise on the top is too lovely. 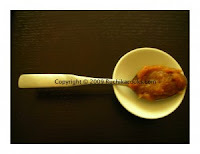 Champa's "Pear Sweet and Sour Sauce" goes good with Samosa, Bonda, Bhaji and Idly. The picture of her sauce is too good. look at the picture, you'l fall in to love with the chutney. future use. See her lovely coloured cranberry thokku. of her spread between two toasted breads makes us drool. be stored for longer period. The picture of her chutney is so good. powder. 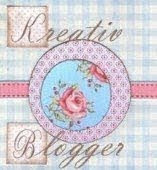 She shares a lovely chutney picture. Umm Razeen's "Sweet Mango Chutney" is very aromatic with the addition of ginger and garlic. This can be stored for future use too. The picture is very colourful. Nisha's "Apple Chutney" is goes well with puri, paratha or toast. 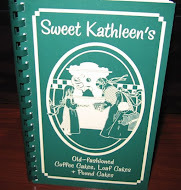 She says, this can be stored and it tastes great when used on the next day of preparation. Chutney picture makes us drool. pictures. Pictures are so nice. 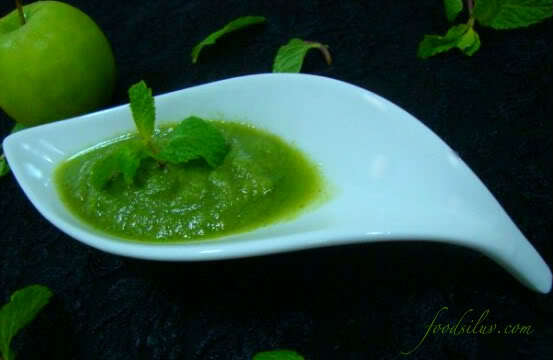 Sangi shares us a very colourful and aromatic "Apple and Mint chutney". She has presented her dish so well. 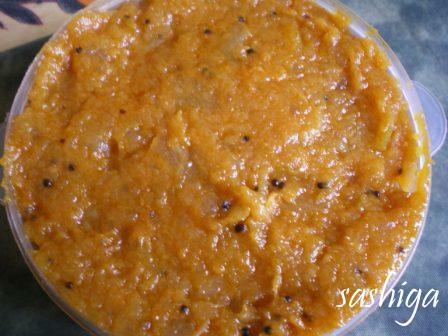 "Spicy Apple Chutney" from Sangi sounds too good and she is too brilliant to make a bowl and lid out of apples. That proves her creativity. 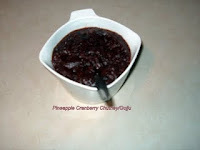 "Cranberry Chutney" from Kiran is absolutely yummy with coconut. The chutney is very colourful and she presented it too good. See how Kiran is brilliant enough to change the peels of the plantain (fruit/veg) to a delicious tasting "Plantain Peel Chutney". Her step-by-step procedure is very helpful. Nayna's "Red Cabbage and Apple Relish" is very unique. 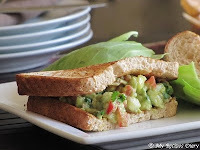 She says, this is ideal as a sandwich filling, served on an open sandwich or rolled in a roti. Look at her colourful relish. "Mango Thokku" from Chitchat is very colourful and spicy. Her thokku and mango pictures are too good. 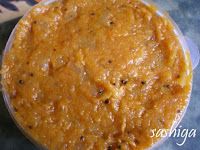 Bharati shares a very delicious "Mixed Fruits Chutney/Thokku". She gives two procedures for the preparation of this thokku. Mango (raw / half ripe/ ripe) – All Fruits Mixed together - 1-2 Cups- Finely Chopped. Chilly Powder-1-2 Tsps ( You can add more, if you like the it hot & spicy). Take a thick bottomed pan & pour oil. Fry the mustard along with asafetida. Add the cut fruits & stir well. Then add turmeric & chilly powders, salt. Mix well. Let it cook nicely. Add jaggery to it. Let it cook till the oil separates. Stir well & remove from heat. This tastes good with all Roti varieties, Dosas, Idlies, Bisibelabath & Bahalabath. Pressure cook all the Fruits for just one whistle. Mash it in the mixie. Then prepare it in the above method. 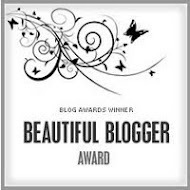 Click here to see Think Beyond the Usual with Fruits - Soups Round-Up. 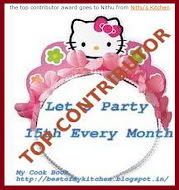 Really amazing to learn so many chutney/thokku varieties Nithu..
plz collect the award from my blog dear! Wonderful roundup, everything sounds and looks wonderful. Nithu,one more beautiful round up.Lots of chutneys to try and enjoy.Thank you. wow all the recipes r so creative, luv this round too! 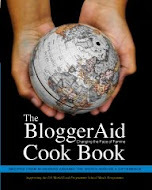 lovely round up...all great recipes..
Lovely round up..so many yummy entires..
Wow, so many recipes. Lovely roundup. Wow!! so many yummy dishes with fruits.